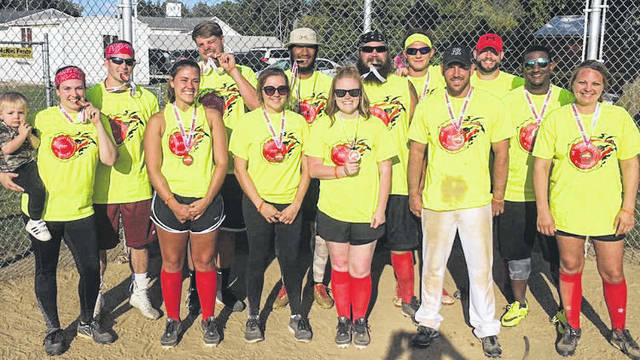 The “Fifth Annual Kickin’ Cancer in the Balls Kickball Tournament” will be held Saturday, Sept. 22, beginning at 8 a.m. at the New Haven Ballfields. In the past four years, nearly $32,000 has been raised to help with the medical bills and expenses of local cancer patients. Pictured is the winning team from last year’s event. NEW HAVEN — One of the largest annual fundraisers in the Bend Area is set to take place Saturday, Sept. 22, at the New Haven Ballfields. The “Fifth Annual Kickin’ Cancer in the Balls Kickball Tournament” will begin at 8 a.m., rain or shine, according to Dana Gillispie, one of the event organizers. Money raised at this year’s tournament will go to Cristin Byler of Jackson, Ohio. Byler has been diagnosed with breast cancer and has already undergone surgery for a partial mastectomy. A unit secretary at Holzer Medical Center, the funds will go directly to her medical bills and associated expenses, Gillispie said. Over the past four years, the tournament has raised nearly $32,000, according to Jared Long, another of the tourney organizers. Last year’s proceeds went to Holden Keefer of Point Pleasant. Sixteen teams have paid $125 each to enter and will compete in the event. Teams are co-ed, with at least four females in the field and kicking at all times. The games will be five innings or 45 minutes maximum, but if an inning is started, it will be completed. Even though the teams have already been chosen and registered, Gillispie and Long said there are many activities for spectators, as well. Food and drinks will be sold, with Kortney Engle handling the refreshment detail. There will be various raffles, including a 50/50, a ride that day on a Health Net helicopter (weather permitting), and gift baskets from Silver Market. Live and deejay music will be provided throughout the day by B.J. Leach. Gillispie said among the corporate sponsors are Holzer Medical Center, Pleasant Valley Hospital, Farmers Bank, Riverside Golf Course, and New Haven Marathon, as well as others. For more information on the tournament, contact Gillispie at (304) 593-8835 or Long at (740) 416-9081.
https://www.mydailytribune.com/wp-content/uploads/sites/42/2018/09/web1_0918.Kickball.jpgThe “Fifth Annual Kickin’ Cancer in the Balls Kickball Tournament” will be held Saturday, Sept. 22, beginning at 8 a.m. at the New Haven Ballfields. In the past four years, nearly $32,000 has been raised to help with the medical bills and expenses of local cancer patients. Pictured is the winning team from last year’s event.